There are tassels and then there are silks. 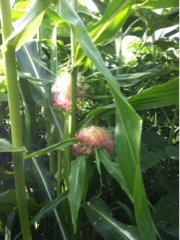 A week or so ago we had tassels at the top of each corn plant. And now there is silk at the top of each ear. The ears are not done growing, they fill in and make each kernel plump before being ready to pull and make for lunch. Or dinner. Or actually, sweet corn is best cooked up and eaten right after cutting from the stalk. Boiled, steamed, roasted, grilled? The best way for corn is fresh, fat, rich. With butter too.